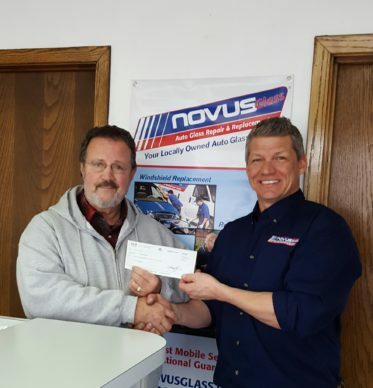 Minneapolis, MN — NOVUS Franchisee Matt Anderson of Spokane Valley, WA raised $1000 for Feed Spokane by running his Golf Glass Break Fundraiser at the Spokane Golf and Travel Show February, 13-15th at the Spokane Convention Center. 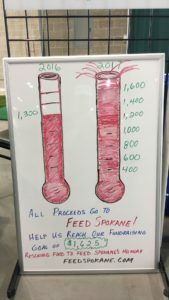 Feed Spokane is a local non-profit food rescue agency that works to eliminate both waste and hunger in our community. The Glass Break Challenge, co-sponsored by Arby’s of Spokane, is set up much like the popular TV show “The Big Break” on the Golf Channel. Participants gave a donation for three chances to hit a golf ball through a pane of glass about 20 yards away. “The Glass Break Challenge gets peoples’ fun and competitive juices flowing while giving them the thrill of striking a glass target,” said Anderson. Participants not only got the satisfaction of hitting the glass but also received a free Arby’s sandwich, fries, and drink. Anderson enjoyed meeting many new people while at the same time being able to help his local community.